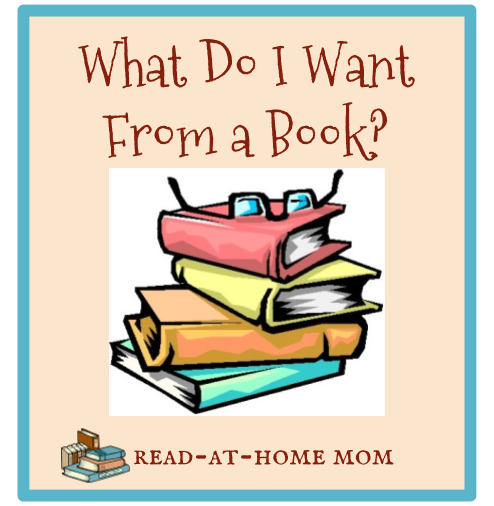 Read-at-Home Mom: What Do I Want From a Book? Great post! I totally agree about believable characters. One of my pet peeves is when a regular person finds out that they're the Chosen One or something and after only a week of training, turn into an expert warrior! Not doing research is another pet peeve. I once read a book set in an area where I had lived and they got so many details wrong that it wasn't even funny! Authors, PLEASE do your research! I don't like those "chosen one" type characters much either. Have you read The Rest of Just Live Here by Patrick Ness? He pokes fun at a lot of the stereotypes associated with that kind of character. Dialog can be done with good word choice to show a regional accent. It doesn't need to be written out pseudo-phonetically. I remember being taught this very thing in a creative writing class in college. It has always stuck with me. Wonderful post. You are the second blogger today that mentioned that a character doesn't necessarily have to be likable in order for you to feel invested in them. I like reading about unlikable characters, as long as the author makes them well-rounded, I'll enjoy it. I have to like something about the story, and that is usually the main character, but not always. The example I always think of is Catcher in the Rye. No one can stand Holden Caulfield, but I love the way Salinger writes. Realistic is a good choice! I love it when it feels as though the book could be happening in real or on a movie screen. Oh my gosh, realistic dialogue is so important!! I have DNFed many books because the dialogue was so awful and forced. I get hung up on small details too. I've been told before that I get too bothered by things like that sometimes, but I just can't stop them from bugging me.